Thinkers50 Management Thinker of 2015 Whitney Johnson wants you to consider this simple, yet powerful, idea: disruptive companies and ideas upend markets by doing something truly different--they see a need, an empty space waiting to be filled, and they dare to create something for which a market may not yet exist. As president and cofounder of Rose Park Advisors' Disruptive Innovation Fund with Clayton Christensen, Johnson used the theory of disruptive innovation to invest in publicly traded stocks and private early-stage companies. 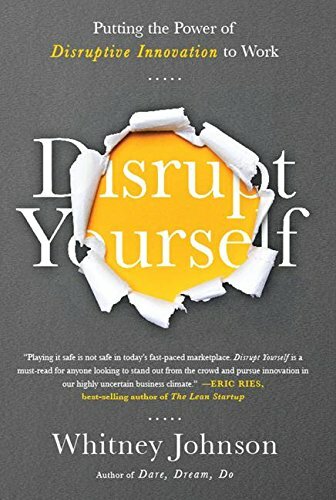 In Disrupt Yourself, she helps you understand how the frameworks of disruptive innovation can apply to your particular path, whether you are: a self-starter ready to make a disruptive pivot in your business a high-potential individual charting your career trajectory a manager looking to instill innovative thinking amongst your team a leader facing industry changes that make for an uncertain future We are living in an era of accelerating disruption; no one is immune. Johnson makes the compelling case that managing the S-curve waves of learning and mastery is a requisite skill for the future. If you want to be successful in unexpected ways, follow your own disruptive path. Dare to innovate. Do something astonishing. Disrupt yourself. Disrupt Yourself helps people to think about talent within an organisation, for my ideas around personal disruption I actually made the list of 50 thinkers. I have taken the term personal disruption as first coined by Clayton Christensen and have developed the theory that you can not disrupt as a company, companies do not disrupt only people do. I was awarded the distinction because of my thinking in this sphere and the influence that this has had.